A class action lawsuit against Apple, Google and a number of other high-profile tech companies has been given the green light by US District Judge Lucy Koh. The lawsuit stems from anti-poaching agreements that Apple and a number of other tech companies entered into from 2005 through 2009. Parties to the agreement all promised not to recruit employees from one another. The companies involved include Apple, Intel, Google, Intuit, Pixar, Lucasfilm and Adobe. The suit, originally brought forth by five software engineers in 2011, alleges that the anti-poaching agreements served to lessen their employment opportunities, thereby weakening their negotiating power and ultimately affecting the salaries they were able to command. Counsel for the plaintiffs previously indicated that the anti-poaching agreements may have compressed employee salary levels by 5 to 10 percent. We reported back in April that class action status for the suit was initially denied because the proposed class group encompassed more than 160,000 employees and was deemed to be overly broad. Since then, the plaintiffs made some adjustments and it now appears that the definition of the proposed class group is sufficiently narrow to have warranted a green light from Koh. Koh denied class-action status for the suit in April but gave the plaintiffs' lawyers another chance to show that the alleged conspiracy had a common, anticompetitive impact on employees in different companies that could be shown in a single trial. The evidence they have since presented meets that test, she said in her ruling this week. "This extensive evidence supports plaintiffs' theory that each technical employee's compensation was linked to those of her peers within and across (all of the) firms," Koh said. She said there was also evidence that the companies engaged in "collusive communications" and "benchmarked their compensation structures" to each other. If the facts of this case sound somewhat familiar, it's because a number of the accused companies, including Apple, settled a suit over the same matter with the US Justice Department back in 2010. A chart highlighting the chronology of the anti-poaching agreements can be seen below. 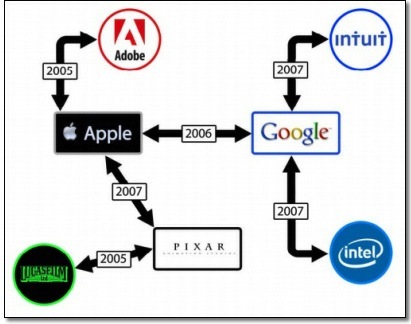 As you can see, Apple got in the game early, striking deals with Pixar, Adobe and Google. Note that the current class action suit only targets Apple, Adobe, Google and Intel as the other three companies already reached confidential settlement agreements with the plaintiffs. It'll be interesting to see how this all plays out given that the plaintiffs appear to have a rather strong case that even includes damning emails from company CEOs. For instance, one message that was brought to light during the US DOJ case involves Steve Jobs emailing then Google CEO Eric Schmidt and asking him to stop trying to recruit an Apple engineer. "I would be very pleased if your recruiting department would stop doing this," the email read. Schmidt subsequently responded to Jobs, informing him that he'd pass the email along and that he would ask the folks responsible to "get this stopped." Another damning email penned by Jobs involves him threatening former Palm CEO Ed Colligan with legal action if he kept recruiting Apple employees. Colligan's response to Jobs reads like a smoking gun. Your proposal that we agree that neither company will hire the other's employees, regardless of the individual's desires, is not only wrong, it is likely illegal. [...] Palm doesn't target other companies -- we look for the best people we can find. l'd hope the same could be said about Apple's practices. However, during the last year or so, as Apple geared up to compete with Palm in the phone space, Apple hired at least 2 percent of Palm's workforce. To put it in perspective, had Palm done the same, we'd have hired 300 folks from Apple. Instead, to my knowledge, we've hired just three. A trial on the matter is scheduled for May 2014.